A down year right out of the gate for today’s NFL rookies will force even the best college prospect to fend off the infamous ‘bust’ label going into their second season, a quarrel few first-year flops come out on top of. Beating the odds in previous years, Los Angeles Chargers running back Melvin Gordon and Pittsburgh Steelers interior defensive lineman Stephon Tuitt both improved significantly as sophomores in the league after falling flat as rookies. Gordon’s 83.0 overall grade in his second year trounced his rookie grade by 36.6 points, while Tuitt bested his 45.0 overall grade by 35.0 points in Year 2 of his career. 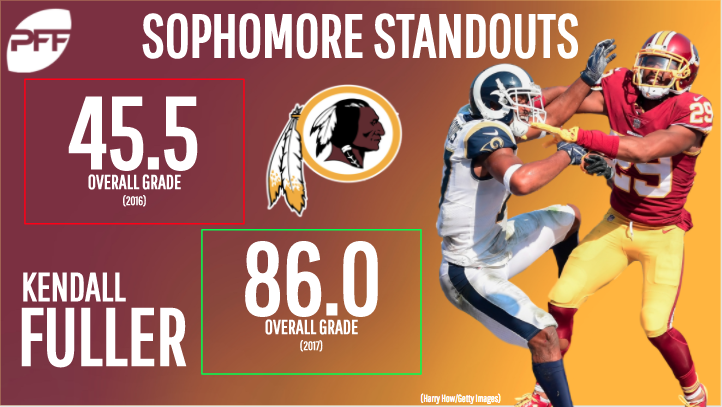 Now 10 weeks into the 2017 season, several second-year players have successfully rebounded from disappointing rookie campaigns to nix the naysayers and bypass the potential label of ‘bust.’ Here’s a look at four of these standouts, who are trending up as of late. Leading the league’s top team through Week 10, Wentz is a no-brainer for this list given his rapid development within the Eagles’ run-pass-option-laden offensive scheme. Now running more RPO concepts than any other NFL offense, Wentz has benefited from the quick reads RPOs create both pre-snap and during the play, leading to significant improvement in multiple areas of his game. 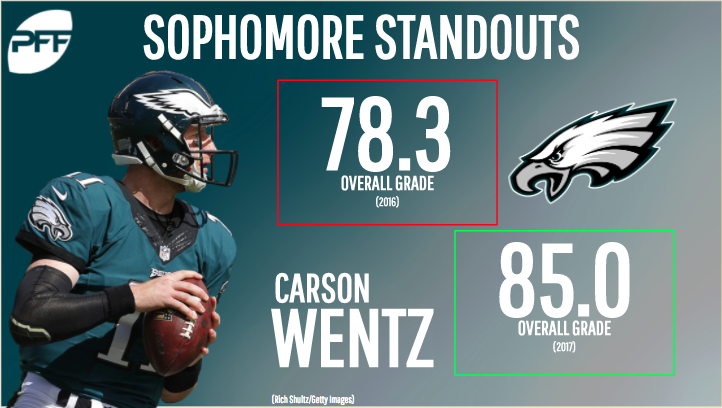 Fueling his 6.7-point increase in overall grade (78.3 to 85.0), Wentz has most notably developed his ability to produce consistently under pressure. He now owns the 14th-ranked passer rating on pressured dropbacks at 71.4, which is 38.6 points higher than his mark in 2016. He also holds the second-highest passer rating on 3-step concepts as well. Additionally, Wentz is first in the NFL in passer rating and overall grade on third downs so far this season, allowing Philadelphia to consistently extend drives and dominate time of possession. Though the Eagles’ upgraded arsenal (LeGarrette Blount, Jay Ajayi, Alshon Jeffrey, Torrey Smith) and a shift in scheme deserve a majority of the credit for his advancements, Wentz’s ability to capitalize on said changes should not be taken lightly. 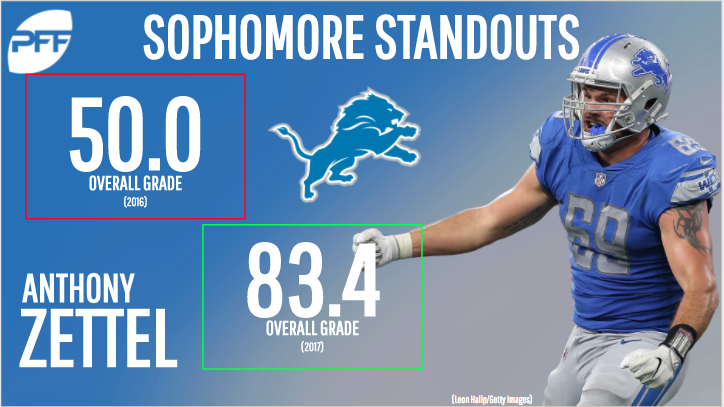 While expectations were likely low for the 2016 sixth-round pick, Zettel struggled to get anything going within his limited role (214 defensive snaps) as a rookie, leading to his 50.0 overall grade. However, now penciled in as a starter, the former Penn State product has quietly become one of the Lions’ top defensive players. Zettel’s 83.4 overall grade in 2017 ranks third among Detroit’s defensive starters and 20th among the NFL’s edge defenders, an obvious improvement from his replacement-level grade a season ago. Adding to his development, Zettel has improved his pass-rush productivity score from 4.7 to 11.1 as a sophomore, recording a team-high 30 total pressures (21 hurries, two hits, seven sacks) on his 207 pass-rush snaps. Similarly, what was previously a flaw in Zettel’s game has become one of his strengths. After finishing with a 48.2 grade against the run last season, he ranks 19th among edge defenders with his 83.7 run defense grade. A player who’s rise won’t show up in the box score, Thuney’s development at offensive guard is unparalleled among the other guards in the 2016 draft class. 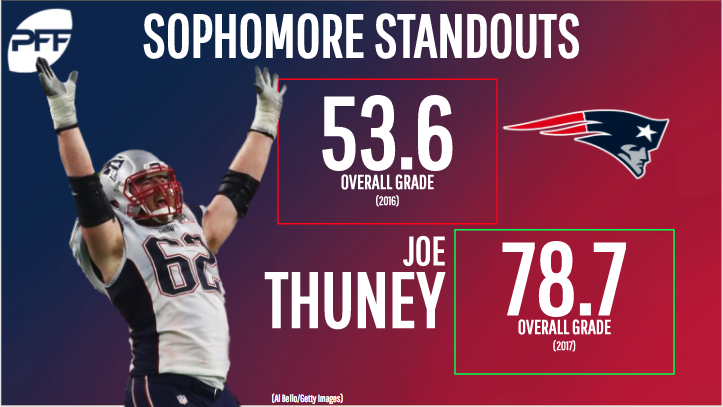 Selected as a second-round pick in April of last year, Thuney took part in a trial-by-fire as the Patriots’ 16-game starter at left guard (1,114 offensive snaps). As expected, the former NC State product didn’t come out of his rookie season unscathed, as his 53.6 overall season grade ranked 52nd among all NFL guards. Committed to the Thuney experiment, New England has sent him out as the starter for all nine of their games this season. However, a much-improved, new-look Thuney has emerged. After allowing 45 total pressures as a rookie, Thuney is on pace to allow 10 fewer pressures in 2017, leading to an 18.5-point increase in his pass block grade. Additionally, he has improved his run block grade from 50.5 to 74.8. Thuney’s 78.7 overall grade ranks No. 1 among all second-year offensive guards this season, including the four that bested him in 2016. After Fuller posted a 45.5 overall grade last season, fans and media alike were quick to draw comparisons to his older, underperforming brother Kyle Fuller in Chicago. However, Kendall’s efforts in 2017 have put such claims to rest. Now fully recovered from a knee injury that hurt his draft stock and plagued his rookie campaign, Fuller has become Washington’s shutdown corner in the slot. Fuller ranks tied for second among cornerbacks with 200-plus snaps in the slot in yards allowed per coverage snap (0.86) and first in passer rating allowed (63.5). Conversely, he ranked second-to-last and last in said categories, respectively, last season. Having earned an 86.0 overall grade through 10 weeks, Fuller ranks 11th among all NFL cornerbacks in both overall grade and coverage grade.